Sooner Sluggers is a place where kids, coaches and parents can come together for the love of the game. Our facility offers baseball and softball batting cages and machines for youth and adults. We supply everything you need, bats, helmets, balls and a fun safe place to practice. There are 4 batting cages available, and reservations are per tunnel by hour slots which can be booked through the reservations page. 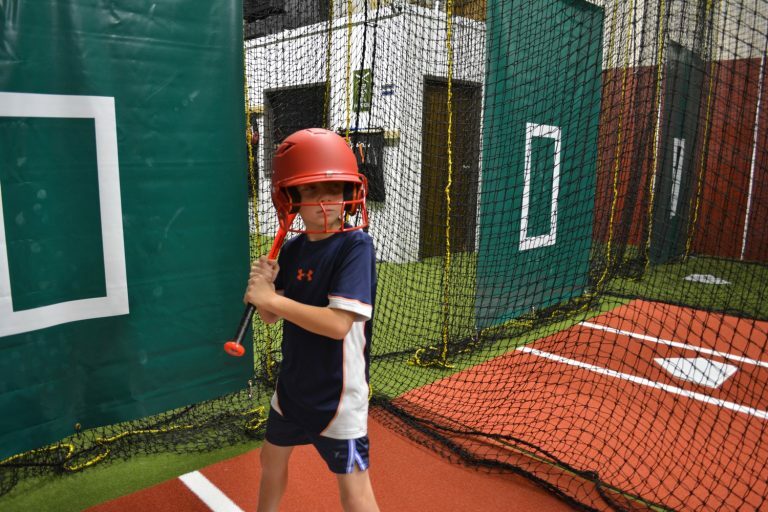 Team booking for multiple batting tunnels at the same time is available, see our coupons page for team discounts. Besides batting machines we also offer T-Ball mounds for the little sluggers to practice as well. Cage rentals are $30 per hour for a single tunnel. Use the reservations page to check for availability. Teams can make special bookings at discounted rates. It is recommended that teams of 8 or more should reserve the entire facility. Currently Team bookings for the entire facility are $80 an hour. (Coupon Code: TEAM4). It is recommended that one make payment at the time of making the online reservation, using either PayPal or STRIPE for direct VISA, MasterCard, American Express. Visit Sooner Sluggers, the Batting Cages in Norman, OK. Our facility is ideal for customers in the surround area of Norman, Moore, Noble, Goldsby, Blanchard, Newcastle and Purcell. Our batting cages are located in Norman, Oklahoma just off the I-35 Interstate. Walk-in's are welcome, however one should check our reservation schedule first to check on availability. There are 4 tunnels each with pitching machines and screens. By using the reservation booking system you can see how many (if any) of the tunnels are available for a specific time slot. Time slots are by the hour, for an entire hour and are set to start and end on the hour (30 minute intervals or other are not supported by our booking system.) Additionally one can pay here. If an employee is present they can run Credit Cards or do PayPal billing. Otherwise one must pay via cash or check. One can leave cash or check payments in the concessions box located on the right wall as you enter. If an employee is present the door will be unlocked. Otherwise the door is secured with a pin number access pad. Before a pin # can be given you must contact us at 405-561-2243 and once a reservation is confirmed you will be given a unique PIN number to use to get in. It is the responsibility of the customer to follow the rules (posted on entry wall) and use proper judgement and caution when using this facility unattended. Note that security cameras are in use on the inside and outside of the premises. We offer a few concession items such as snacks and drinks located in the entry room. Prices are posted on the wall next to a black box marked "concessions". Please pay with exact amount for any items you take into the concessions box. Thank you. We offer JUGS™ pitching machines that can be setup as either Baseball or Softball and for Slow or Fast Pitch. You can use our tunnels for T-Ball practice. We supply t-ball stands at no additional cost. We can split the tunnels with a screen giving you twice as many batting chambers. We supply sting free baseballs and softballs, bats, helmets, home plates, t-ball stands and pitching machines. You can choose use our equipment or your own. We are proud to be able to offer a great batting facility at the best prices in the entire Oklahoma metro area. Besides having great rates to begin with Teams who book multiple batting cages for the same hour can get extra savings. We are also avaible for indoor soccer and futsal practice. Best for youth players looking for a climate controlled envoriment. Teams that rent multiple tunnels for the same time slot can save up to $20! Visit our coupons page for codes and rates for details.